The National Museum of Computing needs your help. A painting is missing. That’s not that unusual but this one is of the Harwell Dekatron / WITCH. The huge painting Portrait of a Dead WITCH by John Yeadon may not be in the world’s top ten list of missing works of art, but it is one that is now eagerly sought by The National Museum of Computing on Bletchley Park. 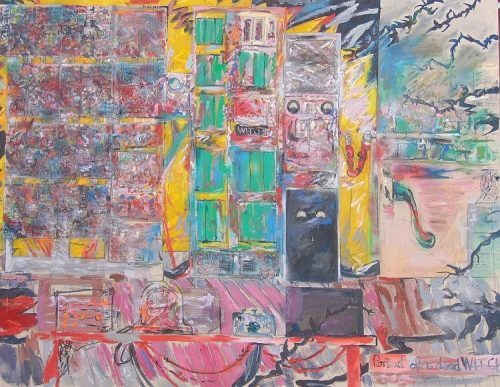 The painting’s subject, the Harwell Dekatron / WITCH computer, is the world’s oldest working digital computer. The machine itself has had a charmed life surviving several threats to its existence until it was restored to rude health at TNMOC in 2012 to become one of the museum’s star attractions. Today, the whereabouts of the 1983 Portrait of a Dead WITCH is unknown and the Museum and the artist are trying to locate it. It was last heard of in October 2014 when it was sold at auction in Lincoln to an unknown buyer for just £75! At seven feet high by nine feet wide, the acrylic painting is almost life-size and would be hard to miss! The painting, like its subject, has had a chequered history. It was created by artist John Yeadon in 1983 because he was so fascinated by the then ‘dead’ machine in Birmingham’s Museum of Science and Industry: “It was a a diabolical contraption, a dusty hunk of electric and mechanical hardware that reminded me of the disturbing 1950s Quatermass science fiction television series that so impressed me as a child. On completion, the painting was exhibited at Leicestershire Schools and Colleges Show in 1984 and then bought by Leicestershire Local Education Authority as part of the Leicestershire Artworks Collection. At some point it was loaned to Newbridge High School in Coalville, Leicestershire, but when it converted to Academy, the painting once in a public collection was auctioned off privately, much to the chagrin of its creator. John Yeadon now wants to locate the painting for a retrospective exhibition when he reaches the age of 70 in two years’ time. He has contacted the auction house, but drawn a blank in finding the purchaser. Today, the Harwell Dekatron / WITCH computer is in almost daily use and is an inspirational machine for the many groups of students that visit TNMOC for the Museum’s Learning Programme. John Yeadon, born 1948 in Burnley, studied Fine Art at Hornsey College of Art 1966-69 and the Royal College of Art 1969-72. He has exhibited throughout Britain and abroad, lecturing at Coventry University 1973-2002, ultimately as MA Fine Art course leader. He has also been a visiting lecturer on postgraduate programmes at the Slade, Goldsmiths, Chelsea College of Art, Wimbledon School of Art, Reading University, Glasgow School of Art and in 2007 at the Royal a College of Art. In 2012 he founded the Coventry / Dresden Arts Exchange.